Stan Williams posed the question “What good is an infallible Bible without an infallible teacher? The NT never claims infallibly for itself or its Table of Contents. 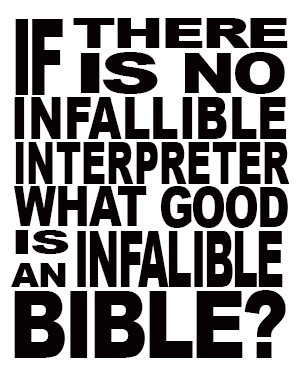 Without an authoritative Church and without the Infallible Interpreter we don’t even have an infallible book. · Fallible men, under the inspiration of the Holy Spirit, forgive and retain sin. Interesting that Protestants claim the first bullet point but sidestep the rest, as if (Mary Kochan just wrote), as if the H.S. spoke on his own and not through men. I think the Protestant scholar would say that the New Testament is infallible and is an objective source of knowledge about God. Our interpretations of it, like our interpretations of nature, can be exploratory, not final, provisional. We study God’s word and God’s world. With both, our studies never exhaust the object of our study and our study is always provisional. The problem then becomes do I need to know infallible truth to be saved? If so, where do I find it if your interpretation of the proposed infallible NT is provisional, exploratory and subject to revision? I think they would then respond that on the important matters like salvation we know enough to be saved. My response would be, fine. Is that an infallible knowledge of salvation or a provisional knowledge of salvation? If his response is an infallible knowledge of salvation I would say that he has contradicted himself because he said his interpretations are always provisional and subject to revision. So why should I take his interpretation of salvation to be infallible when other Protestant scholars require different interpretations of salvation. The Churches of Christ require baptism, Quakers have no sacraments, Liberal Protestants are often universalists and require nothing more than recognizing that you are already saved. Wesleyan scholars seem to expect a second work of grace to precede salvation (I am uncertain about this last one). I want to firstly Thank God for you and truly appreciate what you are doing for the Church. I never am able to figure how you have the time to deal with so many things here. Says something about your commitment! Thank You! I am from India and first heard you in Muscat, Oman. I chanced upon your sessions. I constantly have been through a lot of charismatic retreats back in India and here as well. However, when often confronted with questions on apologetics, I only have failed attempts for narrowing down on good Catholic sources. I am constantly confronted by Atheists, Unitarianss on different topics. What I find on youtube are a lot of Protestant material. There’s barely any Catholic apologetics on these matters. For instance on topics like ‘The Trinity’, I learnt from a video blogger – Inspiring Philiosphy about the C.S. lewis attempt at explaining ‘The Trinity’ with the ‘3-Dimension’ explanation and ‘the Trilemma’ explanation for the Deity of Christ, Before posting this on the internet for the benefit of my fellow church goers, I have to reconsider if this is in line with the teachings of ‘The Catholic Church’ because it is very tempting to be used against Atheist and Unitarians. I can’t decide if I should, though. My Problem basically is the existing lack of – Catholic enthusiasm(For which I too am part), Catholic sources and the catholic outreach strategies. Is it me or are there really lack of sources? What is my part in improving this situation? I am confused and sad. I really need to know. I know you can guide me here. I know you might not be very familiar with the Catholic settings in India but its mostly Charismatic and addressed at personal levels. Evangelization based on theology is really not in the books, I think. Besides Steve’s wealth of knowledge, look at Catholic.com, anything from Scott Hahn, John Martignoni at his website biblechristiansociety.com where he has CD’s and even audios that you can listen to on apologetics. I hope this helps. Try the Apologetics forum here at Steve Ray’s site . There are Priests, Greek Scholars , extremely well read people . Most of them are former Protestants who are now Catholic and have read and read some more and convinced themselves about the truth of the Catholic Church . They will willingly point you towards resouces online and books . Thank You, Mike! Thank You, Eddie! They are going to be of much help to me and my friends at Church. Besides, I was troubled a bit while I wrote my first comment at the lack of Sources and If I could be instrumental in God’s work for his Church? In the following days, I was able to see few young Catholic Apologists striving in this direction on youtube as well. Plus, I did chance upon a page ‘Catholic and Proud’ and they have materials addressing popular atheist questions the Catholic way quoting early Church Fathers. I was delighted at that, truly. Quickly, added couple of my friends to the page. Basically, I see, God is at work. It is very touching to see Catholics leave their zones and enter into debates, Q&A, video blogs etc. I engage myself as well in my little way, for now! And yes, My friends and I listen to Dr. Scott Hahn and others. We try to keep pace with online availability of EWTN programs as we don’t get that here in India or Oman. Dinesh D’souza is a popular Christian debator who I follow on his page and he was a Roman Catholic from India and well, I guess, now he is Evangelical. He explained once how he strived to establish a Christian college(King’s College) in New York(Secular city) and how he goes into public squares to debate almost militant atheists like Christopher Hitchens, Richard Dawkins etc and even earned accolades from Christopher Hitchens to nearly striking a chord with Hitchens. I wish we could do that as well and that there might be more catholic fearlessly walking into rather secular settings. Are there any Catholic debators besides Dr. Scott Hahn(who I already follow) that I can Listen to? Can you suggest a few? I did search a lot. I only found Mr. Sam Shamoun, who I think is Easter Orthodox who debated the popular Shamir Ally(Muslim). One more thing that troubled me quite a bit when I once read that, the popular Muslim Debator – Ahmed Deedat challenged the then Pope John paul 2 to a debate and was turned down and he went on to say that Catholics are playing ‘Hide and seek’ . Although, I do understand the Pope’s stance but even after, not one catholic challenged him to a debate. Most Muslim conversions are attributed to him and his successor Dr. Zakir naik. And these guys are from India. Do you guys see the need to equip myself? I can speak. I can speak, well and I really have to put it to good use. I feel a strong urge to go in this direction. kindly, Advice. Thanks! Ravi Zacharias, the well known Christian Apologist, states that a coherent worldview must be able to satisfactorily answer four questions: that of origin, meaning of life, morality and destiny. He says that while every major religion makes exclusive claims about truth, the Christian faith is unique in its ability to answer all four of these questions. And then he systematically proceeds describe how each questions needs to be answered and meet the criteria of coherency and correspondence to truth, etc. I really like the way this is done, but I want a catholic source that does the same. I think it is brilliant, but maybe there something better from a Catholic apologist or a Doctor of the Church.